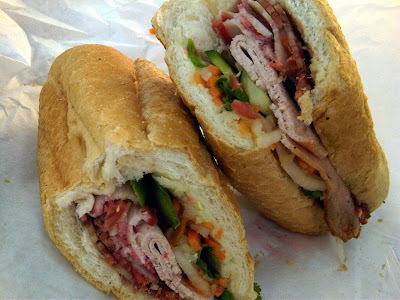 Friday my friend Wendy took me to a local restaurant for a Bánh mì Vietnamese sandwich. The filling of grilled beef and cured pork cold cuts, pickled daikon and carrots, fresh cilantro sprigs and cucumber slices--and jalapeño, splash of soy sauce, and spread of pate on a french baguette with a light, crackly crust just makes my mouth water at the thought of biting in to another sandwich. There are many more places to get Bánh mì sandwiches than what I have listed so I will keep updating this page when I try a new shop.